Perhaps Burgoyne should have pushed the retreat north more quickly. Now it was too late. The 1777 Schuyler Mansion was constructed after Burgoyne burnt it in October 1777. Courtesy of the National Park Service. As they retreated, the British burned what they could. 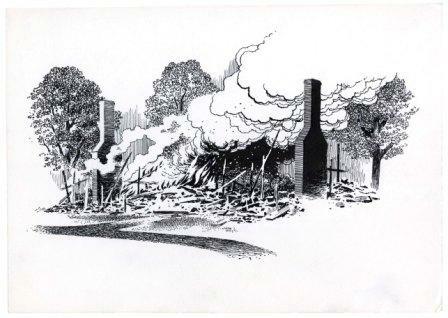 1975 illustration used by the National Park Service/Harpers Ferry Center for wayside exhibits at Saratoga National Historical Park. The Rebel troops approached. Rebel Generals John Fellows, Jacob Bayley, and John Stark, along with Colonel Daniel Morgan and his Virginia Rifleman had completely surrounded Burgoyne. He was trapped. Burgoyne began to entrench his position. He burnt the Schuyler House, most of the outbuildings, and retreated to the north side of Fish Creek. Sweeney’s. A great place for breakfast, served till 2 pm. Real homemade corned beef hash. 70 Broad Street, Schuylerville. Sweet Lou’s. A great variety of deli sandwiches, a salad bar, soups, and a daily hot entree special. They also sell cupcakes made by cake catering business next door. 161 Broadway, Schuylerville. Revolution Café. Welcoming spot along the Champlain Canal for sandwiches—many named after Revolutionary War figures associated with the Battles of Saratoga—as well as tacos, paninis, burritos, and salads. 31 Ferry Street, Schuylerville. Amigos. Mexican cuisine with a southwest accent. Voted best Mexican restaurant in the Saratoga Region. Great margaritas. 42 Ferry Street, Schuylerville. Clark’s Steakhouse. Perfect for dinner, serving sumptuous steaks, seafood, burgers, and more. The building used to be owned by Clark’s Textile company in the late 1800s to early 1900s. They made gloves for pilots. 120 Broad Street, Schuylerville. This restored 1777 country house of American General Philip Schuyler is located in the Village of Schuylerville, approximately 8 miles north of the Battlefield. The building you see today is the third house the Schuyler family had constructed on this land. 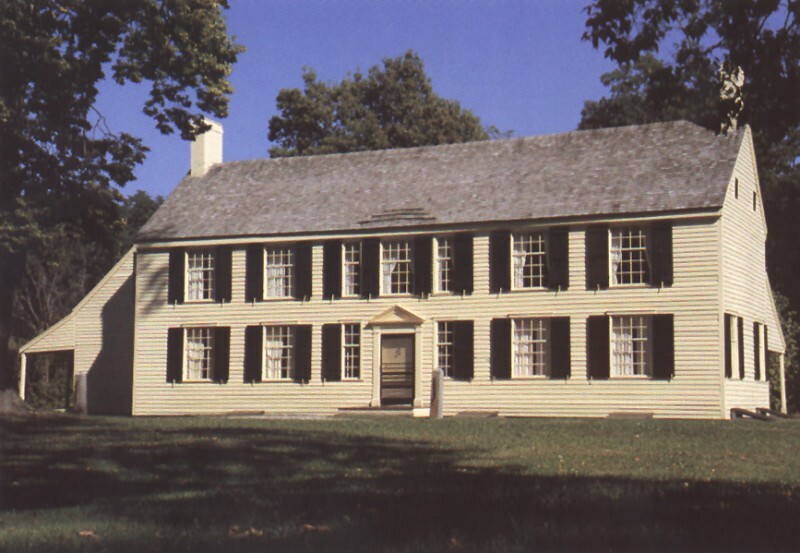 The house that stands today was built in 29 days in November 1777. General Philip Schuyler rebuilt this house using much of the glass, nails, locks, and hinges salvaged from the burned home. It is now a part of the Saratoga National Historical Park. In season, Schuyler House is open for guided tours. A schedule of the tours is available at Operating Hours & Seasons page. Play Track 29 while you are stopped at the Schuyler House. Lieutenant Digby describes the day after the second battle. Took post in a battery which commanded the country around, and the rest of the army surrounding the battery and under cover of our heavy cannon. About 8 in the morning we perceived the enemy marching from their camp in great numbers, blackening the fields with their dark clothing. From the height of the work and by the help of our glasses, we could distinguish them quite plain. They brought some pieces of cannon and attempted to throw up a work for them, but our guns soon demolished what they had executed. Our design was to amuse them during the day with our cannon, which kept them at a proper distance, and at night to make our retreat, but they soon guessed our intentions, and sent a large body of troops in our rear to push for the possession of the heights of Fort Edward. During the day it was entertaining enough, as I had no idea of artillery being so well served as ours was. Sometimes we could see a 12 pounder take place in the center of their columns, and shells burst among them, thrown from our howitzers with the greatest judgment. Most of their shot were directed at our bridge of boats, as no doubt they imagined we intended to retreat that way; but their guns were badly served. About 1 1 o’clock general Frazier died, and desired he might be buried in that battery at evening gun firing. So fell the best officer under Burgoyne, who from his earliest years was bred in camps, and from the many engagements he had been in, attained a degree of coolness and steadiness of mind in the hour of danger, that alone distinguishes the truly brave man. At 12 o clock some of their balls fell very near our hospital tents, pitched in the plain, and from their size, supposed to attract their notice, taking them perhaps for the general’s quarters, on which we were obliged to move them out of the range of fire, which was a most shocking scene,—some poor wretches dying in the attempt, being so very severely wounded. At sun set general Frazier was buried according to his desire, and general Burgoyne attended the service, which was performed I think in the most solemn manner I ever before saw ; perhaps the scene around, big with the fate of many, caused it to appear more so, with their firing particularly at our battery, during the time of its continuance. About 11 at night, the army began their retreat. General Reidzel commanding the Van guard, and Major General Phillips the rear, and this retreat, though within musket shot of the enemy and encumbered with all the baggage of the army, was made without loss. Our battalion was left to cover the retreat of the whole, which from numberless impediments did not move until near 4 o’clock in the morning of the 9th and were then much delayed in breaking up the bridges in our rear. This was the second time of their being destroyed that season—the first by the enemy to prevent our pursuing them. What a-great alteration in affairs ! Our hospitals full of sick and wounded were left behind, with a letter from general Burgoyne to general Gates, in which he tells him he makes no doubt of his care to the sick and wounded, conscious of his acting in the same manner himself had the fortune of war placed it in his reach. During our march, it surprised us their not placing troops on the heights we were obliged to pass under, as by so doing, we must have suffered much. We came up with the general and the line about 9 in the morning at Davagot, seven miles from the enemy. It then began to rain very hard and continued so all day. We halted till near 3 in the evening, which surprised many ; about which time, a large body of the enemy were perceived on the other side the river, and supposed to be on their way to Fort Edward in order to obstruct our crossing at that place, on which we were immediately ordered to march after burning all unnecessary baggage, camp equipage and many wagons and carts, which much delayed our line of march. Funding provided by a grant from New York State Council for the Arts with the support of Governor Andrew Cuomo and the New York State Legislature.